Artist Ellen Jewett (previously) continues to create sculptures of animals from the land and sea, crafting realistic depictions with a surreal edge. Each porcelain creature features elaborate elements that connect the animal back to its natural environment—such as green leaves that sprout from the wings of a black cockatoo, or tiny yellow fish that are found along the spines of her ornately patterned seahorses. After she forms each sea turtle, octopus, or fish from porcelain, Jewett free-models a wire armature by hand and coats the piece in polymer. This addition allows her to connect detailed elements such as flowers and other fauna to the animals fins or claws. Her solo exhibition On Wilderness is on view at the Ottawa School of Art’s Main Gallery in Ontario, Canada through November 18, 2018. Her work is also being exhibited in the group exhibition Nature Imagined at the Wilding Museum of Art and Nature in Solvang, California through January 2019. You can learn more about her process by following her work on Instagram. Ceramicist and mathematician Guy Van Leemput forms textured bowls by drafting interlocking lines, abnormally shaped circles, and other designs on the surface of balloons. The artist begins by adding a porcelain stamp to the bottom of his rubber mold and then working his way in a circular motion upward. 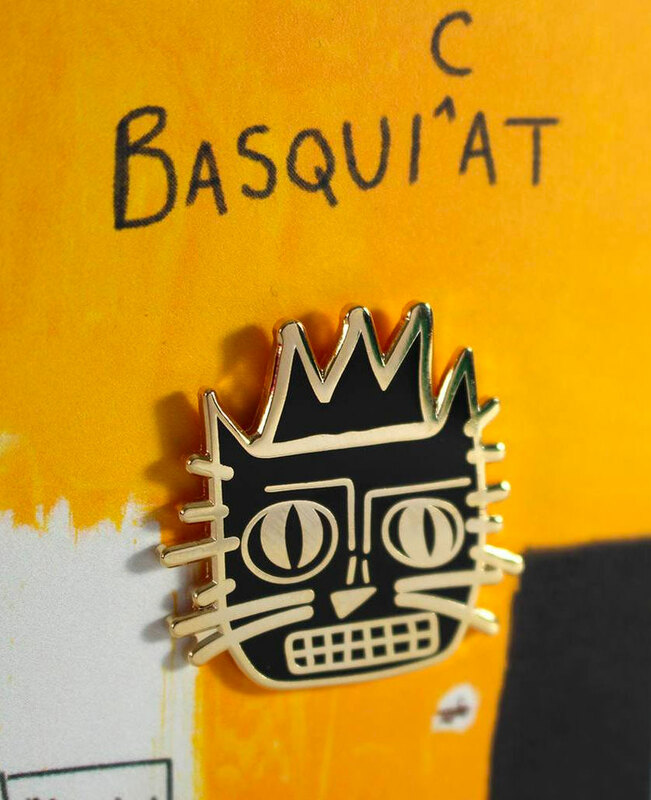 Although his designs are geometrically inspired, he creates each piece based on intuition rather than a pre-determined template. When finished, the pots are so translucent they appear as if they were formed from paper. This aesthetic, both in the works’ color and technique, was inspired by ancient Italian fresco paintings, and has been a part of his practice since 2014. 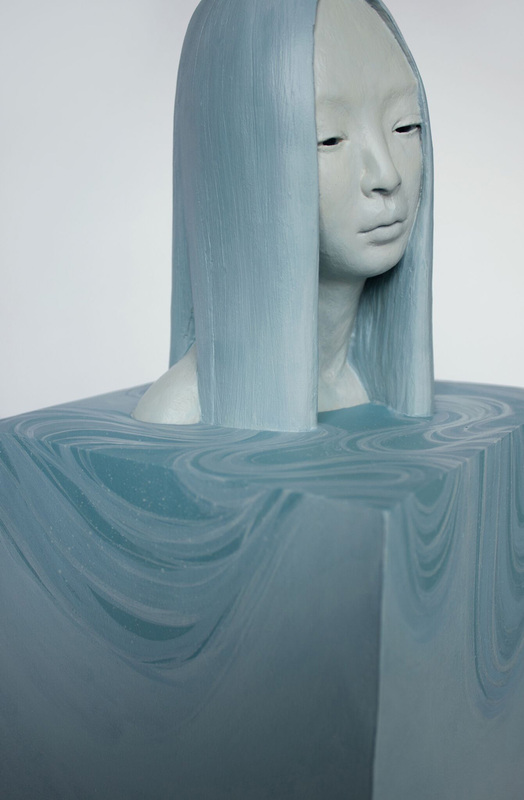 Toronto-based sculptor Gosia (previously) constructs minimally-hued porcelain busts of contemplative female forms from a variety of materials, including ceramic, polymer gypsum, resin, and most recently, porcelain. Her very first experiment with the new medium is included in her current solo exhibition, Beneath the Surface, at Paradigm Gallery in Philadelphia. The work is an imperfect cast, a mistake which Gosia details in the text below. 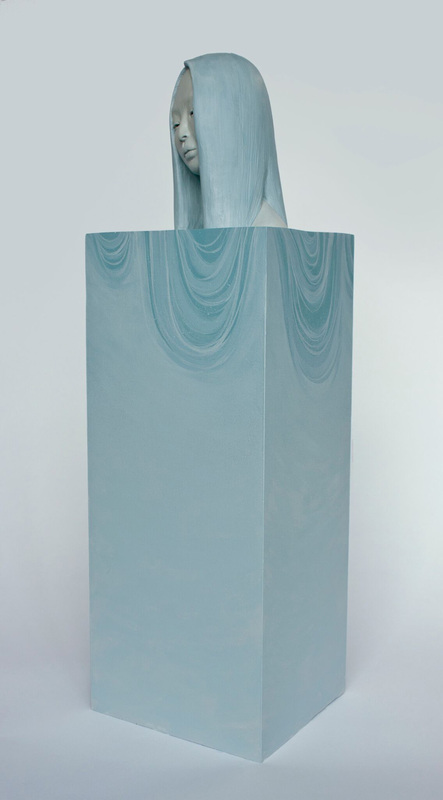 Other new works include Overflow, which features a female figure inside of an elongated cube. The subject’s long hair flows into the pedestal’s depths—a structure that seems to at once support and swallow the imbedded figure. Two other pieces are each titled Beneath the Surface, and were created with the combination of opaque and lucid materials. Translucent resin composes the bottom the sculptures’ faces to their nose, making it appear as if each have dipped partially underwater. “Beneath the Surface” runs through June 16 at Paradigm Gallery. Gosia’s first European show, “The Windows of the Soul,” opened this past weekend at Dorothy Circus in London. You can see more of Gosia’s work on her website and Instagram. 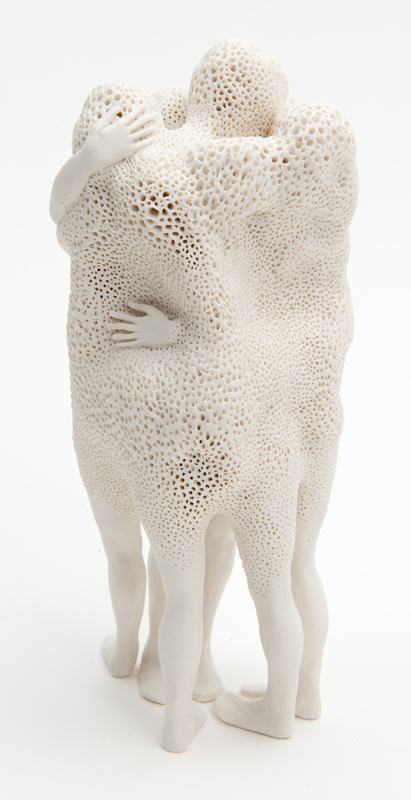 I chose porcelain for its luminous and ghostly qualities as well as its strength and ability to show fine texture. It highlights both the impermanence and fragility of natural forms in a dying ecosystem, while paradoxically, being a material that can last for thousands of years and is historically associated with high status and value. The artist’s work is included in a group show at the Everson Museum of Art in Syracuse, NY, which is open through April 15, 2018, and she is also leading a week-long workshop on porcelain sculpting at Idyllwild Arts in California in June 2018. You can see more of her work on her website and Facebook page. I began to make [Foreigners] in response to the English landscape that surrounds me and to my cultural understanding of it as a foreigner. I generally find the images out of which they are born during walks in the nearby forest and in the field that begins as soon as I cross the street where I live. During these walks, I concentrate in observing the process of transformation, interaction and the mechanisms of adaptation that happen amongst the creatures that share this particular bio-political system. 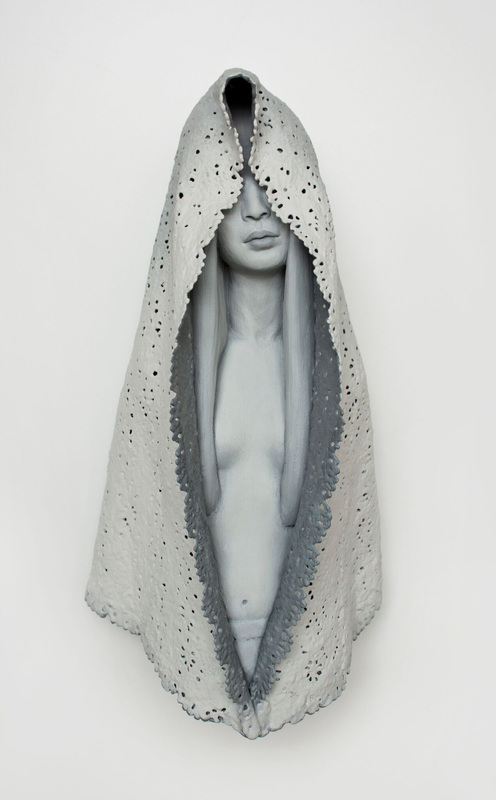 Her technique is inspired by Jasperware, a type of stoneware covered in thin ceramic reliefs invented by Josiah Wedgwood in the late 18th century. Like Wedgwood, she carefully applies her delicate forms to a porcelain base. From start to finish a larger work will take Hosono nearly a year and a half to complete. Much of this time is spent drying, as her densely layered works often need 10-12 months to completely dry. 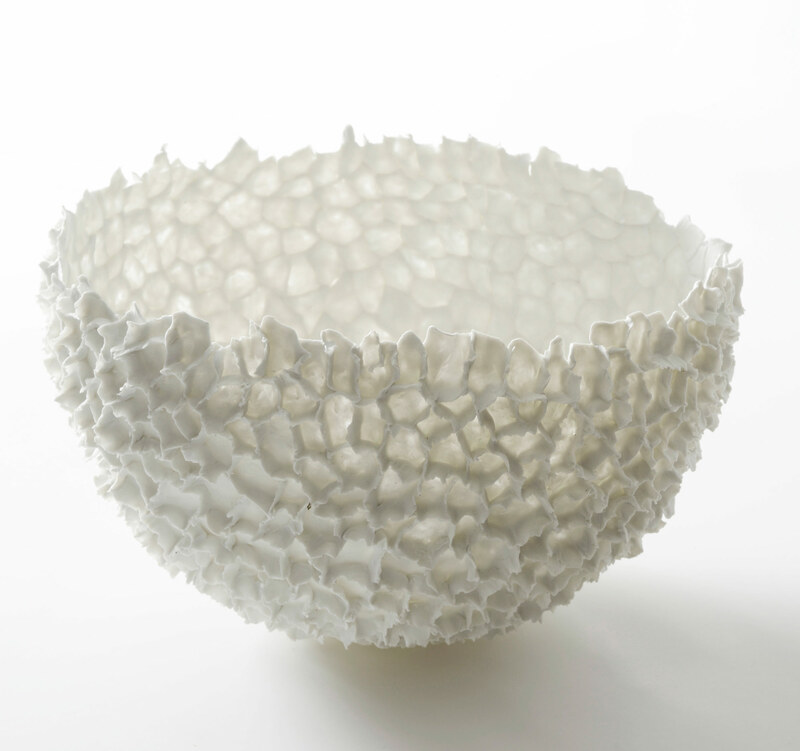 Hosono’s solo exhibition, Reimagining Nature: Hitomi Hosono’s Memories in Porcelain, is currently on view at the Daiwa Anglo-Japanese Foundation in London through December 15, 2017. You can see more of her layered botanical sculptures on the artist’s website and through her gallery Adrian Sassoon.